Poor George Lazenby. He certainly drew the short straw when it comes to actors portraying Bond; he only got one film. But luckily for him, it’s a good’un. On Her Majesty’s Secret Service is a great movie, and Lazenby does the best he can portraying Bond in a more human way (which is especially effective in one particular scene, but more on that in a minute). But Lazenby is defiantly not Sean Connery, and perhaps it was due to him being unsure in such an iconic role, but Lazenby isn’t as memorable as Connery. But the film makes up for it by having some particularly awesome action sequences and the best Bond score so far. Because of these we can over look a slightly forgettable Bond, and an absurd plot; which is something about spreading a virus distributed by a group of brainwashed beautiful women; making everybody in the world infertile. It’s one of the weirder ones. The awesome action scenes mainly involve some form of Winter sports. I’m not fully sure why there is a ton of skiing scenes and even a bobsled chase, maybe because Winter Olympics had just been? I’m not sure, but these scenes are extremely awesome and well directed and are a definite highlight of this Bond period. The best action sequence in my mind though would have to be the climatic battle at the Piz Gloria in Switzerland, which culminates in a Bond vs Blofeld bobsleigh chase. The score to OHMSS is also a highlight of the era, and is defiantly my favourite Bond score by the late, great John Barry. Listen to this, for an example. The performances of OHMSS are somewhat of a mixed bag. Lazenby manages for the most part, excelling at some points (the heartbreaking finale for example) and at other points being slightly forgettable. Bernard Lee as M, Lois Maxwell as Miss Moneypenny and Desmond Llewelyn as Q are awesome as always and seeing them interaction at Bond’s wedding is a brilliant, funny scene. And that brings me on to perhaps the best part of OHMSS; Diana Rigg as Mrs James Bond, Tracy di Vicenzo. The only woman to truly capture Bond’s heart is also perhaps the best Bond girl of them all. She’s funny, beautiful and can hold her own against many a foe and doesn’t have a stupid name (I’m looking at you Holly Goodhead). Telly Savalas as Blofeld is also good. Many people don’t like him, and maybe he is too American for the role and he doesn’t have the same menace as Donald Pleasence’s Blofeld, but this version of Blofeld can get involved in the action scenes and that’s why I like him; he’s smart but can also hold his own. Blofeld’s presence does bring up a big plot hole though; Bond and Blofeld meet face to face while Bond is pretending to be a historian Sir Hilary Bray, but neither recognise each other! Just because the actors have changed it doesn’t mean the characters have. Another mild annoyance with the film is Bond’s line at the beginning of the film; “This never happened to the other guy.” These sort of things are how the stupid ‘James Bond’ is just a code name rumors started, and I hate that idea. Contrary to this though, OHMSS is one of those Bond’s that celebrates what it is rather than trying to escape it, a la Quantum of Solace. We see things from Bonds past, previous gadgets from the earlier films, and the title sequence features footage from earlier films. OHMSS is a Bond film for Bond fans and showing how the previous films are in fact connected to the current one is a great little idea which was lost in Bond films over time. 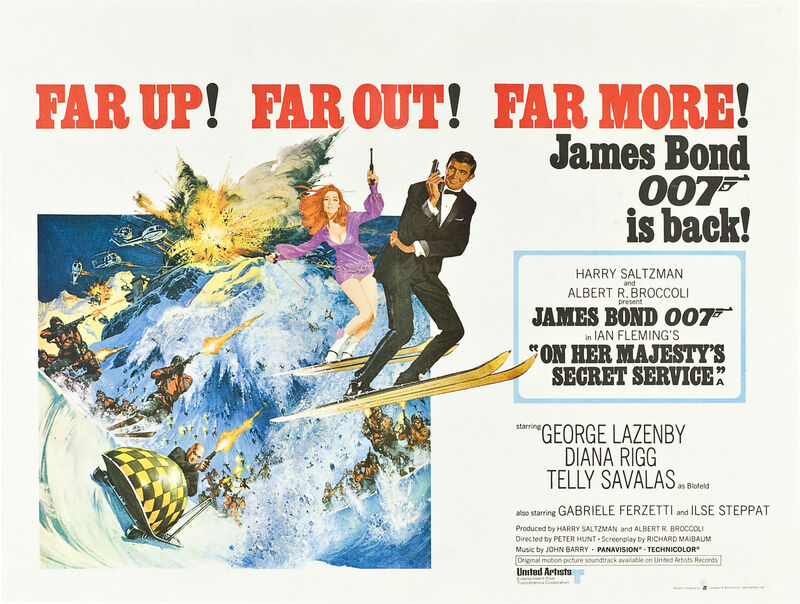 The Bottom Line: OHMSS is an underacted Bond adventure, featuring a slightly underrated Bond, some of the best action of the series and perhaps the best Bond score and Bond girl of all time. OHMSS might not be the best for newcomers to the series but it is certainly one of the best for die hard fans. I think the director, Peter Hunt, or the script writer Richard Maibaum, should have changed the movie slightly in that case. In my opinion the movies should be their own continuity and not have to adhere to the continuity of the books. In OHMSS they make reference to past films as well, so for anyone who hasn’t read those particular books the fact Blofeld and Bond don’t recognise each other immediately is just a glaring plot hole.